Condo, Studio, 1 Bath, (Sleeps 2-4) Best Suited for a Single, or Couple. We are strategically situated directly across the street from the Whistler's largest supermarket, drug store, liquor store,Starbucks,etc and at the start of Whistler's pedestrian walk of shops, restaurants, bars, etc. The ski lifts are about a 15 minute walk or you can take the FREE shuttle bus. This spacious studio condo is larger than most. 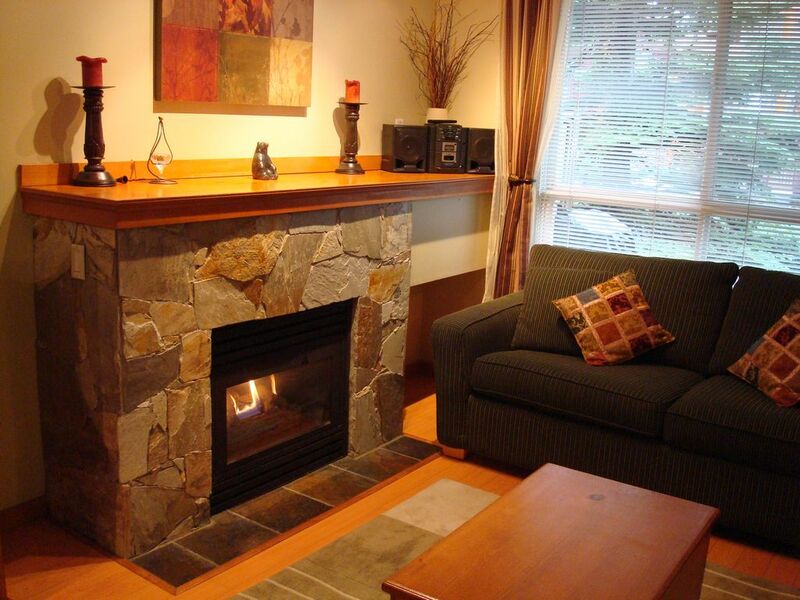 It has a private entrance and secure underground parking, is tastefully decorated, with a cozy gas fireplace . The studio suite has a queen-size bed and a sofa bed (queen-size). An outdoor HOT TUB is available to all guests. This is a No Smoking-No Pets suite.We have secure heated underground parking at NO CHARGE! I work in the busy film business in Grip and lighting.I reside in Vancouver. I chose this condo in Whistler because of the location,and the private entrance with no halls or elevator.In the summer i ride my bike off the trail and go right in to the townhouse!. The condo is different because its bigger than most.It is a studio but some owners have walled in the bed to make a one bedroom.I perfer the open plan so i can watch TV from bed. Located on the Valley trail,across the street from Whistler Market Place.